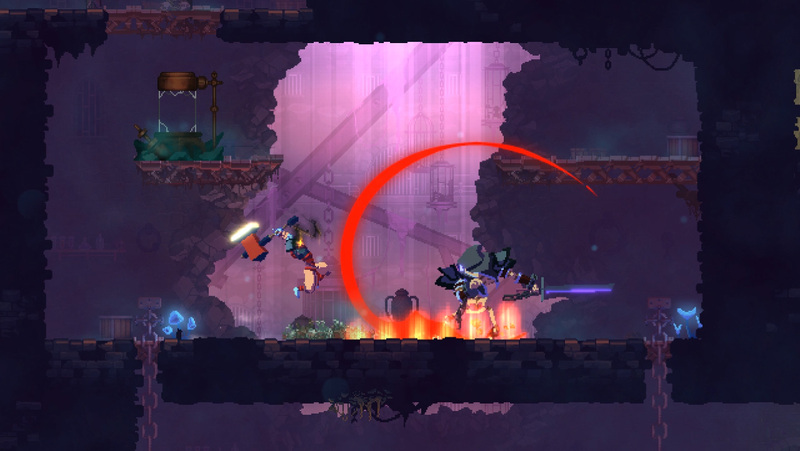 Dead Cells features a great sense of progress and responsive combat. Better soundtrack and enemy designs would have made it even greater. If at first you don’t succeed, die, die again. 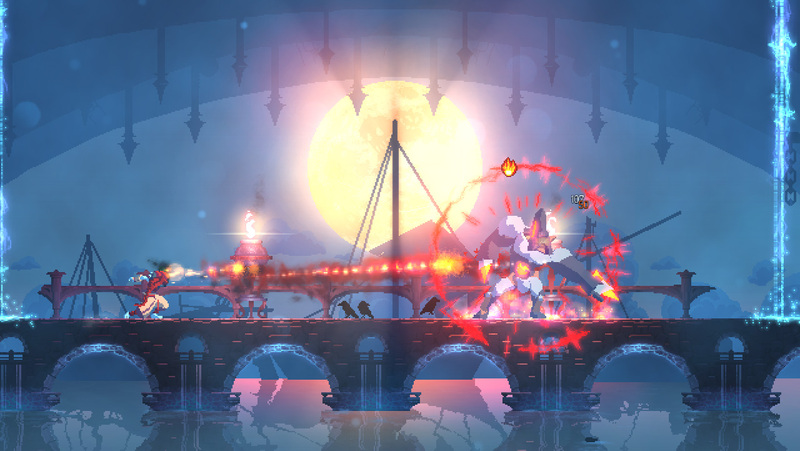 Dead Cells is a new experience every time you die, with “death as progress” being the general guiding principle. It’s incredibly fun every time. It’s been in Steam Early Access for quite some time, but now it’s been officially released with a lot of new content added to it. As a rogue-lite Metroidvania, the game progresses in levels which resemble two-dimensional dungeons, and every time you die you need to start all over again, with little progress saved. It sounds like a hassle, but there are actually has a lot of mechanics that make all of this into a nearly perfect rogue-lite experience, with a lot to offer to newcomers to the genre. The first of these mechanics is… well… dying. Our protagonist isn’t the usual merc-for-hire or hero, but instead a lump of dead cells that can possess the dead bodies of prisoners. As you go around killing monsters, you collect new cells which unlock new abilities, weapons, and other upgrades that you might stumble upon along your way. While this doesn’t sound like a groundbreaking mechanic, every time you beat a level, you’ll keep all the cells you’ve collected, so it guarantees that you’ll constantly cash in on bigger, better upgrades as you play. Even though you die a lot, it never feels like you die because something, somewhere was unfair. I almost always knew exactly what I did wrong, and how to do better next time. As you unlock them using cells, new weapons will become available while you traverse the different levels. Combat is quick and fluid, and every weapon feels very satisfying to wield. 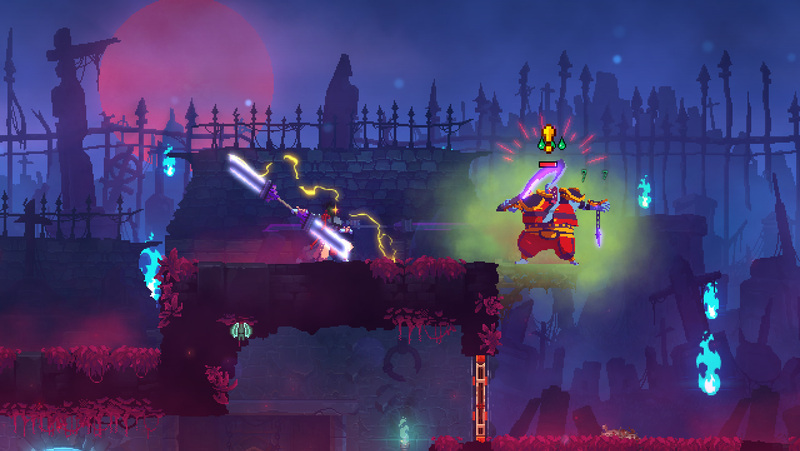 Combining this with the many different weapon modifiers and traps you can use, Dead Cells offers a distinctly different combat experience in every run. But most weapons need more than cells to unlock. You first have to collect the necessary blueprint, and sometimes, it will be quite a challenge to obtain those. Some blueprints require certain unlockable powers to get, while others need to be extracted from elite enemies. Some require you to show off exceptional platforming skills, and others still might just randomly fall out of dead enemies. Finding a blueprint is always very empowering, and I was always excited when receiving new ones. Apart from weapons, your character can also be customized with scrolls of power and mutations. Scrolls of power add to one of your attributes, which in turn strengthens your abilities and weapons matching that attribute. You also get a nice health boost, with is always good in a rogue-lite. The mutations are unique powers that are mixed into each playthrough and can do anything, from giving you a once-in-a-playthrough revival, to adding damage modifiers after taking a hit. Customizing your character helps you make every life feel exploratory and experimental, as you try to find the combination that works best for you. In addition to the mutations, weapons, and attributes that are lost after each death, you also collect runes which give you permanent powers. These are usually obtained after beating a mini-boss in a level and give you new abilities which help you traverse the levels and reach new and exciting locations. Of course, the mini-bosses are fun and cool to battle, but it’s the bosses that put up the real challenge. Fortunately, the game offers plenty of those, each with unique fighting patterns that you’ll quickly learn to predict and counter. It’s not only the combat that changes each time but the entire levels too. The island prison that our protagonist is trying to escape is a living being of sorts, and this is expressed through the procedurally generated dungeons. These levels are made out of different pieces being scrambled together, and while it occasionally mixes in some doors into dead-end rooms, for the most part, the levels feel organic and natural. Going through the same levels, even when they are procedurally generated, can get repetitive. Luckily, Dead Cells has that end covered. Well, almost. The different areas you visit in Dead Cells are called biomes, and these biomes offer diverging paths into other ones. The result is a non-linear experience, and you’ll be able to go down different paths in every run. You can even encounter a different boss in one of these biomes. The biomes also have unique backgrounds that give the locale a distinct tone. It never looks like a randomized level. The problem here is that the earlier biomes are the ones you’ll be passing through most often, which means you will likely get tired of these locations. The game doesn’t offer any geographical checkpoints, which doesn’t really help. From time to time, you’ll also find a hidden location marked with blue candles. Within them, you will see notes or objects which expand about the lore of Dead Cells. There’s no significant story here, which is okay, considering the game’s genre. What you do discover is that you are escaping an island prison after an outburst of a plague known as the Malaise. While our character, only referred to as The Prisoner, rarely speaks, he reacts quite humorously to different situations. He might give a thumbs up, shrug his shoulders, or even flip the bird at characters. I really enjoyed those reactions. Dead Cells has one of my favorite pixel art animations, especially for our prisoner character, who has distinct animations for each of his 50 plus different weapons. But while the player character looks great, some enemies lack in detail. This is especially noticeable with the first boss, The Concierge, which, well, doesn’t really look very original or exciting. Later enemies and bosses look much better, though. Regardless of how they look, every enemy explodes into a bloody pool of dead flesh, and it adds to the very satisfying feel to every kill. As far as sound goes, sound effects are crisp and add a solid feel to every hit and slash. 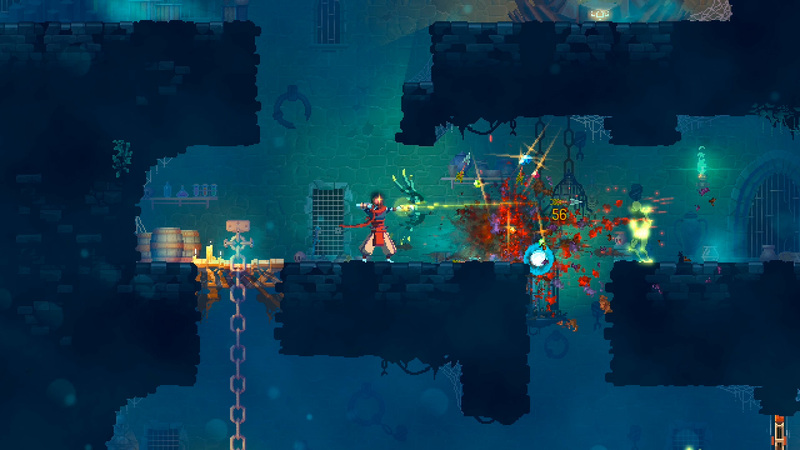 Each of Dead Cells’ weapons sounds different, and I could probably be able to recognize most of them, even with my eyes closed. Critical hits sound powerful, and it all sounds so very, very impressive. But the background music could use some work. While I couldn’t stop humming the melody from the collector’s room – the room where you spend your collected cells in between biomes – the different biomes’ background music could have been more upbeat or catchy. I think that something in the spirit of Hotline Miami’s excellent tracks would have done the trick. That said, later levels have more epic music that suits them well. Dead Cells is fluid, responsive, and highly addicting. Unlocking new abilities and weapons with your cells is fun, and using them is even more so. It’s another one of those rare “just one more round” rogue-lites that you can play for a session after session until you’ve realized you meant to go to bed hours ago. Dead Cells is a great game to get into the rogue-lite or Metroidvania genre. It’s so easy to pick-up and play, and would probably make an especially excellent game to play on the Switch, even though I personally played it on the PlayStation 4. 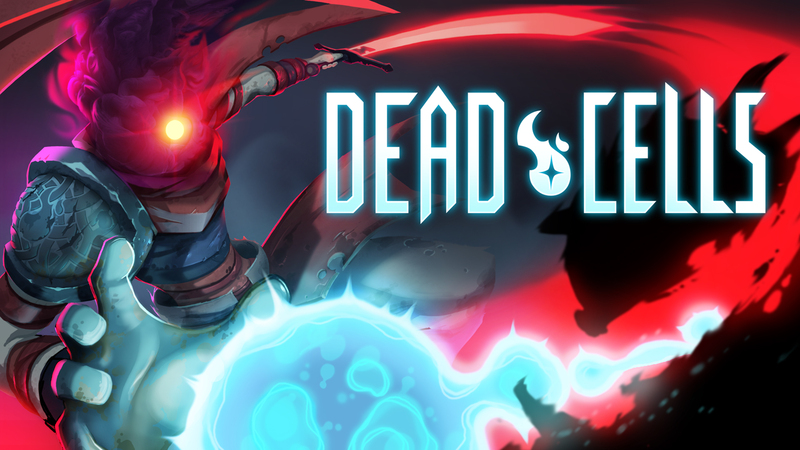 Dead Cells is an exceptional action game, so why not grab it and see how far you can make it before death takes you too?